Think Williamsburg is only a place to eat at trendy artisanal restaurants, shop in hipster boutiques, and drink at some of the coolest bars in NYC? Well, there's more to Williamsburg than funky nightlife and fantastic shopping. Head to the East River State Park, a seven-acre park located on the Brooklyn side of the East River in Williamsburg for some of the most stunning views of Manhattan. This stretch of waterfront greenery is a dose of peace in the middle of this charmingly chaotic slice of NYC. Once just a park for lounging and taking in spectacular views of the Manhattan skyline, now the East River State Park has become a destination and is home to the Smorgasburg and other cool events. Here are six ways to enjoy a trip to the East River State Park. If you have kids in tow, they will enjoy the playground in the park. The park is also home to a popular dog run. 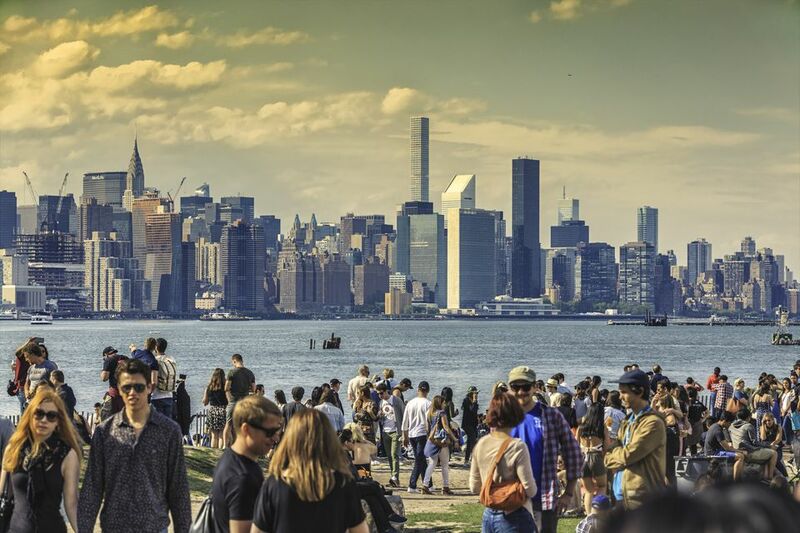 Besides the great views of the Manhattan, if you head to East River State Park in the warmer months, you can enjoy the Smorgasburg on Saturdays at the park. You can dine on a variety of local eats at this famed weekly food festival filled with vendors selling both sweet and savory cuisine. If you're a cook, bring some food to grill at the barbecue area or pack a picnic and enjoy a leisurely meal. What you can see from the East River State Park? Lots! The stellar view of the NYC skyline is one of the highlights of the park. If you don't know what you're looking at, here are some of the buildings you can see from the park. The Empire State Building, The Chrysler Building, The New York Times Building, The Bank of America Headquarters, and The Freedom Tower. Besides buildings, you can also see oats and ferries on the river, occasional barges, the Manhattan Bridge, and the Brooklyn Bridge. Directions: To get to East River State Park, take the L train to Bedford Avenue, and walk towards the river to Berry Street. Pass Berry Street, Wythe Avenue, and Kent Avenue. You'll find the entrance to the Park on Kent Avenue between N. 9th Street and N.10th Street. Visiting hours: 9:00 a.m. until dusk. In order to board the East River Ferry, which makes stops in Brooklyn as well as Manhattan, exit the East River State Park and enter the Brooklyn Flea grounds directly next door. You will see a pier with a loading dock for the Ferry and a sign listing all the pickup and drop off times for the day. One-way tickets and monthly passes are available. The Ferry is a fantastic way to see more of Brooklyn and Manhattan and is highly recommended for tourists. If you aren't there when the Smorgasburg is in session, you can grab food at some incredible restaurants, all just a short block from East River State Park. Sort with a breakfast at Egg for some delicious Southern cooking, or grab some fantastic Tex-Mex with great margaritas at Mole. For great drinks and enormous pretzels head to Radegast Beer Hall, a big beer hall with communal tables. Or grab a cup of coffee at Blue Bottle Coffee, which serves outrageously good coffee. You can walk over to Bedford Avenue, Williamsburg's main shopping drag or you can head to Artists and Fleas located a block from the park. With locations in Brooklyn and Manhattan, since 2003, this Williamsburg market has been home to some of the best creative artists and designers in the area. Open weekends and located in the heart of Williamsburg, the market is the perfect spot to pick up jewelry, records, clothing, and other goods. Vinyl lovers should also walk over to Rough Trade NYC, which is also located across from the park. This outpost of the famed British based record shop doubles as a music venue.